Truth is a thing that doesn’t die ความจริงคือสิ่งที่ไม่ตาย—as the saying goes. 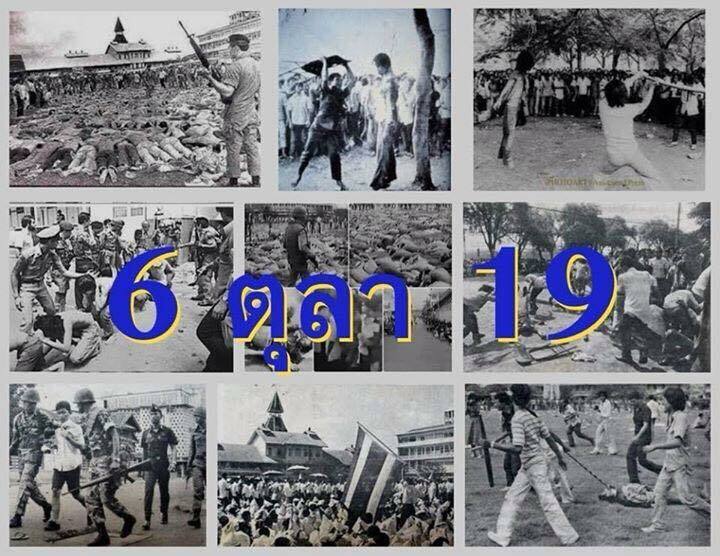 And one day we may know the truth of the Thammasat University Massacre, of 50 to 100 student demonstrators on October 6, 1976. That day college students were killed by an army, police, and vigilante mob in ways so gruesome you can’t ever “unsee” the images. Not only were the students butchered in various and unusual ways, but their dead bodies were desecrated and even raped. The iconic picture from this event is the bloodied and lifeless body of a young person, hanging from a tree, being beaten with a folding chair, while a circle of people watch, some smiling. In addition to the dead, thousands were arrested and were made to strip to the waist and crawl on the ground as a form of humiliation. The event was instigated by accusations that the students were communists and that they had insulted the Crown Prince. In fact, the students had been protesting the return of an exiled dictator to Thailand as well as the assassination of a labor activist. Many of the demonstrators, who had not previously been communists, were radicalized by the shocking turn of events and fled into the jungle to join the communists for several years. A day after the massacre, a coup replaced the democratic government with yet another dictatorship. No one was ever prosecuted for the massacre; everyone involved was granted amnesty. What makes this tragedy especially difficult to understand or accept is that only three years earlier, on October 14, 1973, a similar pro-democracy student uprising had ended in victory for the demonstrators, and that event continues to be celebrated today. Songs are still being written for the heroes of October 14—while those who died three years later on October 6 are ignored or regarded with suspicion, as if they possibly share some blame for being attacked by a bloodthirsty mob. What exactly happened October 6 and why? The facts are still discoverable: it occured in modern times, the victims were from the educated middle class, there were thousands of witnesses (now only being in their late 50s or early 60s), and the whole thing was filmed. (The images are distressing and you may not want or need to see them. But if you need proof, just google.) Because so many progressive Thais were there that day, it is unsurprising that I happen to know several of them, just as most Americans know someone directly affected by 9/11. Yet despite the opportunities to discover the truth about October 6 and learn from it, no consensus has emerged as to what happened, how it happened, and or why. And this is due to an active and ongoing campaign to silence the questions before they are even asked. How many died? Who is responsible? How can we prevent it from ever happening again? Of course, there is a longstanding tradition in Thailand of condemning October 6 memorials as “provocative.” In 2013, to mark the October 6 anniversary, a group Thammasat students staged a play called “Wolf Bride.” Two students Patiwat ‘Bank’ Saraiyam (a man) and Pornthip ‘Golf’ Munkong (a woman) went to jail for two and a half years for lese majesty for putting on that play, and several other young actors had to flee the country to avoid lese majesty charges. And why can’t we talk about October 6? The strong message from the powers-that-be is that talking about the event will be unpleasant and messy, and make it harder for the country to come together around national symbols of the monarchy. That much is true, as rabid royalists played a lead role in the events, and US diplomatic cables report that King Bhumipol at first appeared to treat the massacre as a necessary cost of doing business (in the war on communism) rather than a crime against humanity. The cables are shocking, but not all that shocking. US leaders have been equally accepting of “collateral damage” at certain points in history. Lots of horrible, ugly things happened in the 60s and 70s, both in Thailand and in America, during the war on communism. It was a time of social unrest, student protests, anti-communist fervor, war atrocities, secret undercover government activities, and yes even massacres. This year, in reading an article (that I can no longer access) on the October 6th event, I learned that the worst of the atrocities on October 6, such as the iconic hanging, may have been committed by a small group set up by the Thai equivalent of the US CIA. Reading Wikipedia, I learned that that secret Thai organization was funded by the US CIA to fight communism. A serious investigation of October 6 is likely to dig up a lot of dirt that is uncomfortable to personal and national self-perceptions in either or both countries. It could lead anywhere. So why not reconcile, move on, and just forget the ugly past? This is why we can’t give it up: Because, in Thailand, 40 years after the massacre, Thais are STILL living under dictators; students are still trying to speak out about democracy, and they are still being shut down by those who brand them as dangerous troublemakers who disrespect royalty. There are still hysterical witch hunts. Leaders still look for scapegoats on which they can lay the blame for all of Thailand’s troubles. And there is still a culture of impunity, that lets the well-connected get away with literally ANYTHING. Isn’t it time to start fresh, and build society on a new foundation of truth and human rights? A society that is built on a foundation of happy myths is vulnerable to truth; and it must brutally and continually defend its inconvenient secrets by suppressing the human rights of students and others interested in pursuing facts where they lead. This month a representative of the Thai Alliance for Human Rights will be going to the International Criminal Court in The Hague to report on this massacre and other massacres in Thai history that could be labeled crimes against humanity. Neither Thailand (nor the United States) is a signatory to the Rome Treaty establishing the International Criminal Court, and crimes cannot be retroactively prosecuted even if Thailand does in the future decide to sign on. But at least, our organization will have a chance to report the crimes and be heard. And it indicates a method that Thai people could plausibly use in the future to hold even its most powerful people accountable, to end the culture of impunity, and so discourage future crimes against humanity. This entry was posted in English, General. Bookmark the permalink. January 31, 2014: Thailand needs help!